Baby Bears and Clouds Cellophane Roll 24 inches wide x 50 ft long. 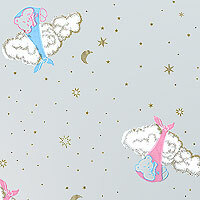 Cute pink and blue sleeping baby bears in pink and blue blankets tied around fluffy white clouds with gold outlines. Gold moons, stars and sparkles surround the baby bears. Cello background is clear.